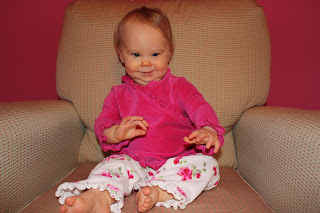 The Loves of Jenn: 10 months old today! 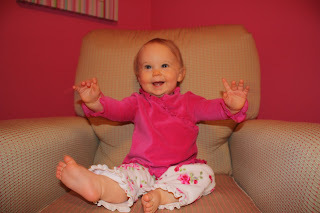 A little certain someone is 10 months old today. I could say time is flying but we all already know that. So I'll just say that I am in full on panic mode that I am not going to get her first year scrapbook done by her first birthday. Probably because I haven't started it yet. Yikes!!!! This is the first one I took. Notice the bow. This is picture #2. 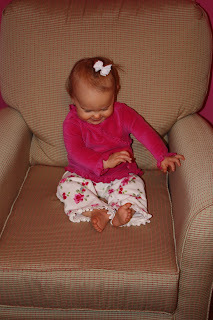 Apparently, she was bored in the chair so to entertain herself, she started dancing (with no music on). Picture #3. Notice the bow. And the absence of the bow in all the other pictures. Those little suckers just won't stay in. The girl got my super fine hair! Finally, a picture where you can see those two little teeth! She has better dance moves than I do! 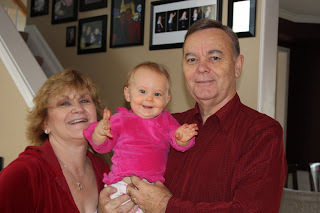 Grammy and papa left this afternoon (insert tear) but before they did I got a group shot. Julianne was waving again. What a fun month it has been. Her first Christmas. A visit from grammy and papa. Pulling herself up on any and everything. Trying hard to walk. And then there is the ever expanding vocabulary. 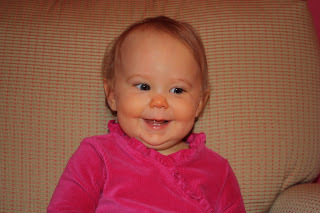 She now says: mama, dada, papa (while my dad was here...ah), hi, bye-bye, baba, and the newest....uh-oh! This is her new favorite thing to say! 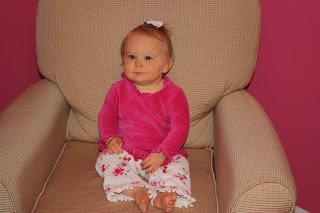 She is getting so big and I'm really missing those baby days....hmmm, what can we do about that??? Just kidding. Not yet but soon maybe. Happy 10 months baby girl. We love you! 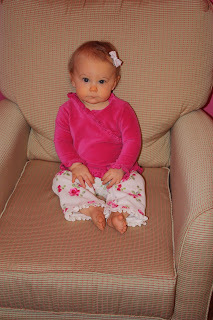 Happy 10 months Julianne! I've just gotta hear her little voice - definitely need to schedule a visit out there! Love the outfit! :) Hope she liked her late portion of her Christmas gift! We missed you and Shaun at the Fiesta Bowl last night. It was a pretty good game, but nothing can top the game that we all attended 2 years ago!